High quality scooter insurance at a low price is what Bikesure have specialised in for years. We have access to a wide variety of specialist scooter insurance schemes, and can offer cover tailored to your exact needs. With cheap scooter insurance prices for learners, younger riders, experienced riders, commuters and scootering enthusiasts we offer a complete low-cost, high quality service to all owners of scooters. And as a specialist broker, we can offer cover if your scooter is a classic, modified, or one of the many Chinese scooter imports available today. If you are looking for mobility scooter insurance, this is offered by our sister company, Chartwell Insurance. Perhaps you're a teenager with a 50cc Chinese import scooter, or maybe a classic scooter enthusiast with a Lambretta. You might enjoy rides with a friend on a two seater Suzuki Burgman, or you may just appreciate your scooter as a stylish and comfortable way to get from A to B. Whatever your lifestyle, there is probably a motor scooter out there for you, but finding a reasonable scooter quote may be somewhat trickier. The problem is that a lot of motorcycle insurance companies don't understand the particular needs of the scooter owner. They don't take account of the many ways in which scooters differ from bikes, and as a result, the unwary scooterist may be charged over the odds. When you take out an insurance policy from Bikesure, you can be confident that the policy matches your needs as a scooter owner. 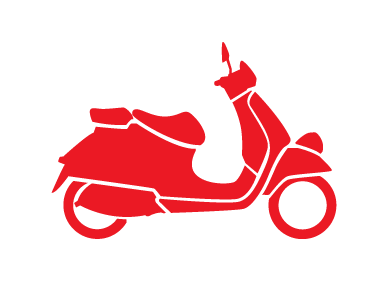 That's because we have access to an array of specialist insurance schemes, many of which have been designed purely for scooters, including tailored schemes catering for Chinese imports, classic scooters and customised scooters. What's more, when you use our online scooter quote and buy system you can instantly compare scooter quotes selected from those available and then choose which one is best for you. If you like the price you see you can buy online, or speak to one of our knowledgeable underwriters to take up the policy or discuss further options. Because our insurance is tailored to your needs, you can choose which features will benefit you most. Every policy comes with £100,000 of free legal cover, but we also offer optional add-ons including personal injury cover, comprehensive breakdown cover and protective clothing and helmet insurance. Full range of comprehensive scooter insurance, TPFT insurance and TPO cheap insurance. UK and foreign licenses acceptable. When I bought a scooter on the internet, I had no idea I'd have to register it myself. I was in a chicken and egg situation, because I needed scooter insurance before I could register it, but no-one would give me the cover until it was registered. Thankfully, Bikesure agreed to insure the scooter using just the chassis number, allowing me to get my registration completed. Sarah is 22 and has owned her TGB 303R Hawk 125 for a year, and uses it to commute to her work from her home in Taunton (TN3). She's a committed biker and passed her Category A test in January 2013. She has 1 year's no claims discount available. The bike dates from 2007 and is worth around £500, and as she lives in a relatively crime-free area, she doesn't have any additional security for the bike. Sarah's rate is just £189.24 for TPF&T cover, or only £135.82 for Third Party Only protection. Owen's rate is just £142.88 for TPF&T cover, or £107.94 for Third Party Only.